The Leadership Bluegrass program pulls together a cross section of people with exhibited or potential leadership qualities into a network of learning and communication. The results will foster a broad-based understanding of the total needs of the bluegrass community, which will help participants better prepare to determine the goals of the particular organization, company or group in which they choose to serve. The selection process for Leadership Bluegrass is competitive, with more applicants than there are positions available. While the application or recommendation does not guarantee a position in the class, IBMA does guarantee that everyone who applies will be given an equal opportunity. 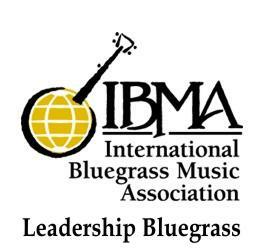 Enrollment and participation in Leadership Bluegrass is voluntary and a new class is selected each year. All class members are expected to bear the expense of any travel and/or lodging during the program as well as pay a class participation fee. A limited number of partial scholarships are available to qualified applicants.